Clarke and Crombie Camp has been in business since 1937 serving people from all over the world. We are located on the SE corner of the famous Lake of the Woods. We offer updated and clean motel rooms for various size groups up to 7 or cabins that have lake views that can accommodate 8 size groups. All of our beds are new to give everyone a great night sleep as you listen to the wildlife outside close by. We also have full fishing service along with guides that have been guiding Lake of the Woods and surrounding lakes for over 30 years. You can catch perch, walleye, small and largemouth bass, lake trout, northern and muskie within minutes from our new in 2018 docks in your boat or one of our boat rentals. We also have our own boat ramp for your convenience. Fishing at its finest is right here at Clarke and Crombie Camp on the beautiful Lake of the Woods. Drive-in Access: We are located 1 hour north of International Falls or Baudette Minnesota on Hwy 71. Fly-in Access: Nestor Falls has a small airport that you can fly into where we can pick you up or you can also fly into International Falls and we can figure out arrangements for getting you to Nestor Falls. Boat-in Access: We are located on the SE most point of Lake of the Woods and we have our own new docks and also a boat ramp on location. Cabin Rentals (Housekeeping): We have 6 cabins with Lake Views and daily housekeeping included with the cost of your stay. All the cabins have updated amenities along with the rustic look of what a cabin stands for. Private Campground: We have 31 RV sites with daily, weekly, monthly or seasonal rentals available. All sites have water & electric along with sewage disposal at your site. We have a clean shower house with 2 washrooms & 2 showers that are cleaned daily. Hotel/Motel/B&B: We have 17 units with clean updated rooms. Our rooms have new beds in 2018 giving you the best sleep. There are rooms available with no carpets for those with allergies. All rooms have at least a small fridge, microwave, toaster & coffee maker; some of the rooms have full kitchens and overlook the lake. Walleye: Lake of the Woods is famous for the walleye. Many trophy fish have been caught right here in Nestor Falls. Fishing can either be done in the summer or winter depending on your preference. Northern Pike: There are many pictures showing off trophy northern pike. Many northern are caught on Lake of the Woods and many mounts have been made from these fish. Muskie: For the avid muskie angler, there is no other. Anglers will travel from miles away at the chance of getting the biggest one ever. There are big ones on Lake of the Woods and angerls will all tell you their stories. 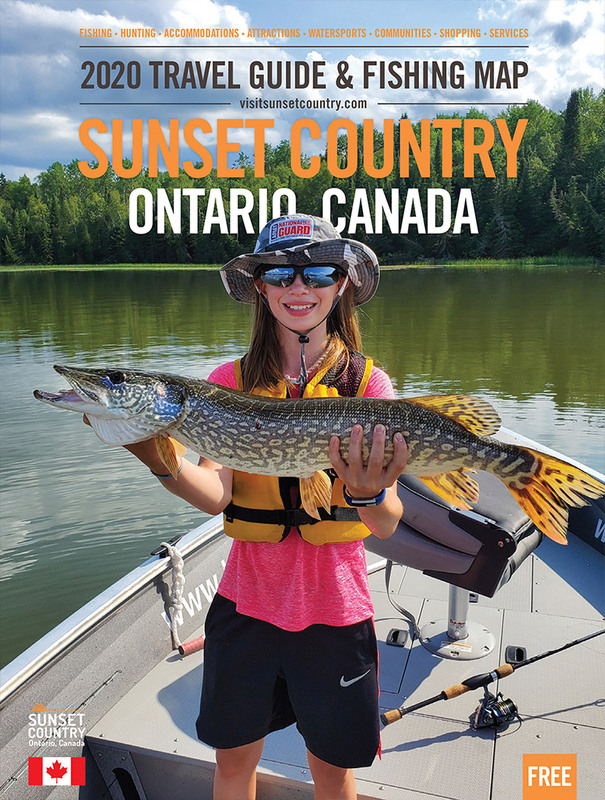 Smallmouth Bass: For the excitement of fishing, smallmouth bass is exciting and draws many people into the area for the sport of fishing along with all the tournaments that Lake of the Woods has to offer. Great fun and bass are exciting to catch. Largemouth Bass: Largemouth bass is another story. There are many anglers that only want to fish for bass and once hooked on bass fishing, it is hard for them to draw away from it. Lake of the Woods has many bass tournaments for the avid angler. Lake Trout: Lake trout can be found on Lake of the Woods along with other local lakes in the Nestor Falls area. Crappie: Crappie fishing is at its finest in both summer and winter on Lake of the Woods. This is one fish that everyone enjoys both catching and eating. Perch: Perch is a great fish year-round on Lake of the Woods. It is a firm fish that everyone enjoys. It's not just for the seagulls. Deer: Deer is a great fall/early winter past time for avid hunters from across all of Canada and the United States. We have many deer in this area and many trophy deer have come from the Nestor Falls area. Black Bear: Bear are always around this area and camp owners are quite familiar with them so we all try to keep everything out of sight and out of mind of the bears. Hunting bear is some hunters dream so come on up and enjoy what we have to offer. Grouse: As some call partridge, we have many and they are fun to shoot for the whole family. This is a great way to introduce the new hunter to the world of hunting. They are also good to eat too. Duck: Duck hunting is a great fall time past time and can be enjoyed by all ages. There is an abundance of ducks around Nestor Falls. Geese: Geese have been increasing over the past few years so there are plenty available to bring home with you and your family. Wolf: In the fall and winter months, you can really hear the howling of wolfs. I think it is the quietness and stillness of the winter that really pronounces the sound of the wolf.